Fall Leaves on the Nebo Loop. We are looking forward to the cooler weather and the beautiful changing leaves. Fall is one of our favorite times of year. 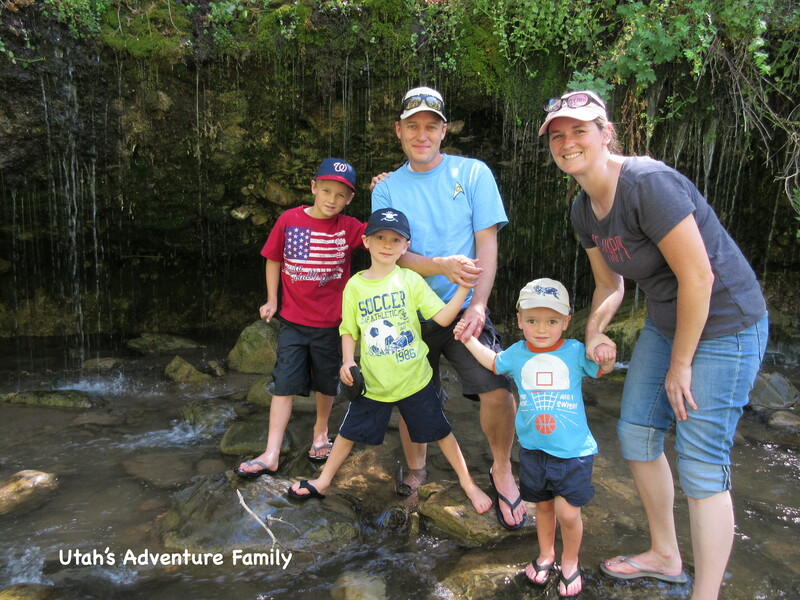 We wanted to share some of our favorite fall activities so that you can start preparing your families’ adventures. Click on the names of any of these activities to be taken to our post with more information. The first sign of Fall is when the leaves start changing colors. 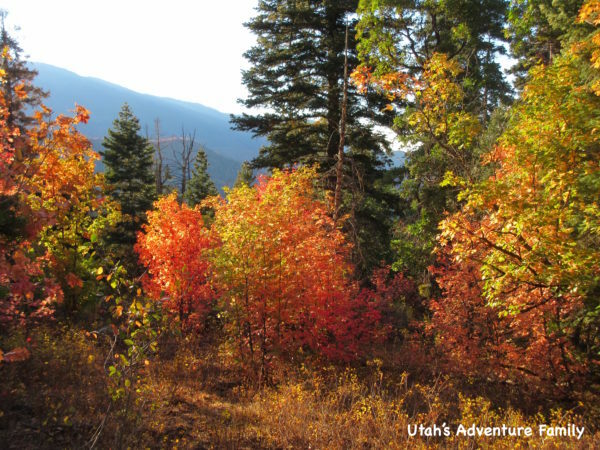 We love finding all the amazing Fall colors throughout Utah. 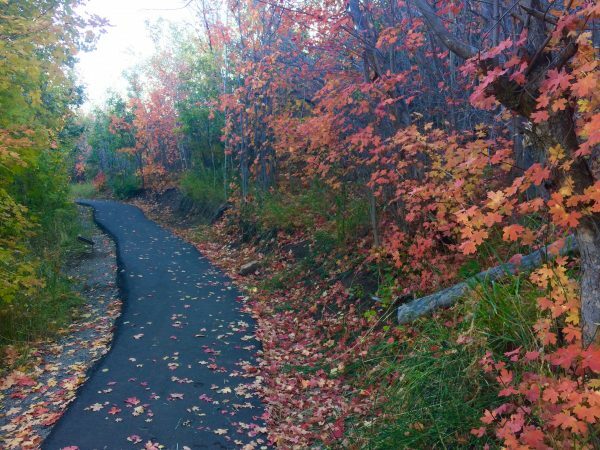 We have a list of our favorite places to see the fall foliage in Utah. There is nothing better than a beautiful Fall hike when the colors of the trees are in full Fall color. 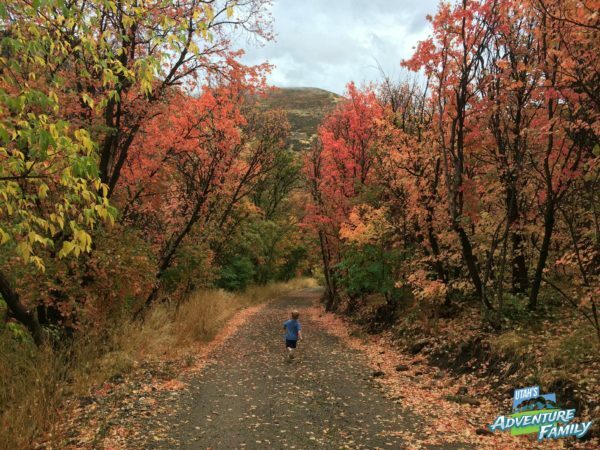 These are our favorite trails in Utah when autumn comes. This is a family favorite. It is a little pricey, but if you purchase tickets early online, you can get a small discount. There are always so many fun activities to do–huge trampolines, bounce houses, wagon rides, large slides, pig races, corn mazes, and much more. We look forward to this event every year. Cornbelly’s is at Thanksgiving Point and it opens September 23rd. Check their website for prices and schedules. Thanksgiving Point members get a 25% discount anytime at the gate. We loved this flying witch! This free adventure is a lot of fun for everyone. Every person in our family enjoyed seeing the funny witches all over the shops. 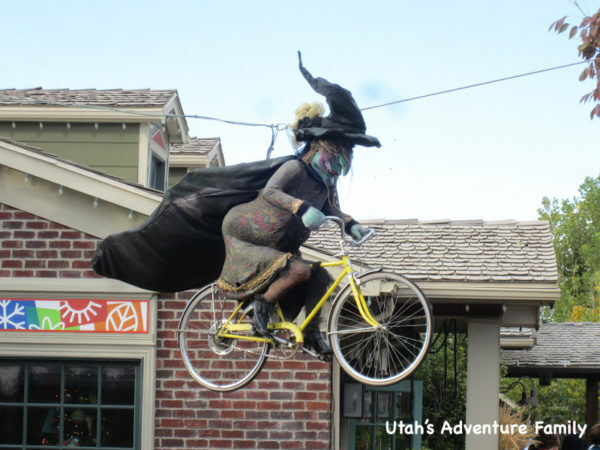 Gardner Village has a scavenger hunt for the children to locate certain witches throughout the village and once they’ve found them all, they can go to the bakery for a discounted treat. Witches are on display September 15-October 31. The Sleepy Hollow Haunted Wagon Ride is actually family friendly. You take a wagon ride and listen to the Legend of Sleepy Hollow. 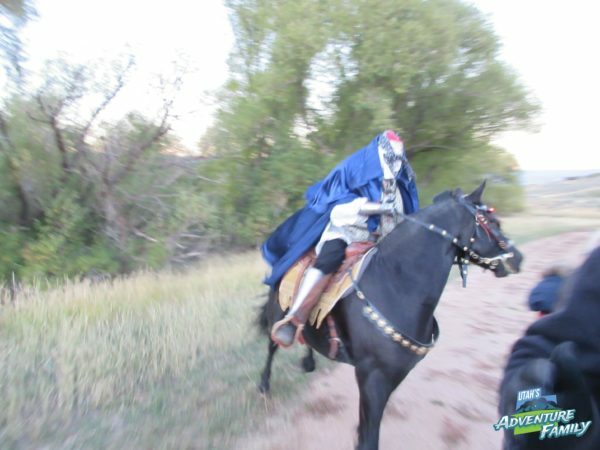 Along the way you encounter different spooks, and ultimately the Headless Horseman. We only took our 10 year old, but he loved it, and there were plenty of small children in the wagon with us. This takes place in Midway. This event runs October 5th, 6th, 12th, 13th, 17th-20th, 22nd-27th, and 29th-30th, 2018. 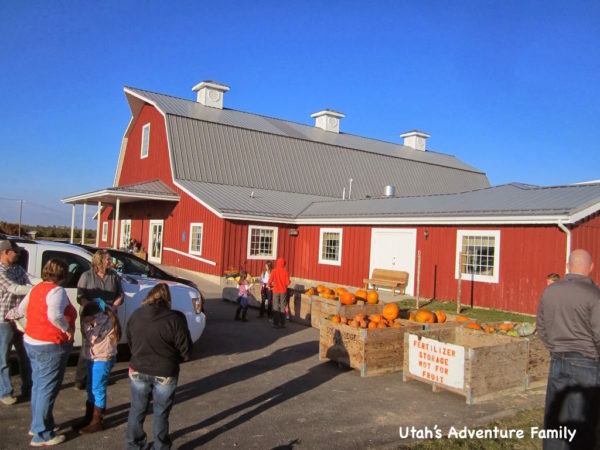 This local farm in Salt Lake has a lot of fun fall activities including a hay ride, train ride pulled by a tractor, corn pit, and the best corn maze ever. We loved how they catered the corn maze to the children by having clues to solve. This is a fun Fall adventure. 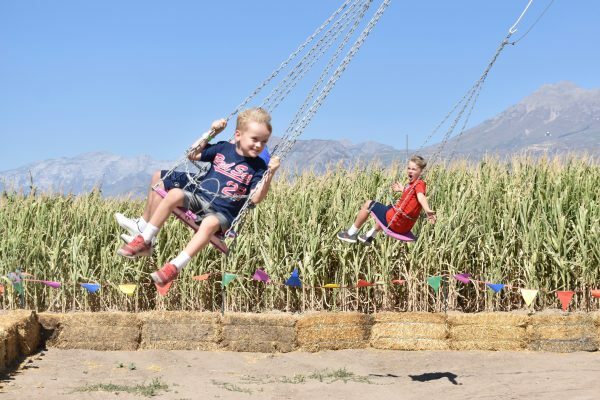 Cross E Ranch’s Fall Festival will run from September 21-October 29, 2018. 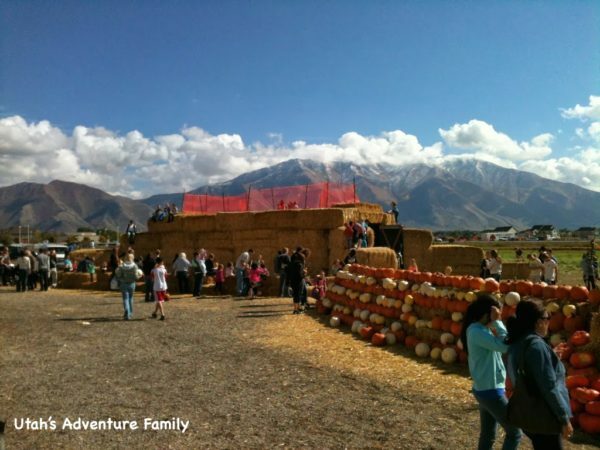 This is a local Lehi farm that has a fun Fall festival. 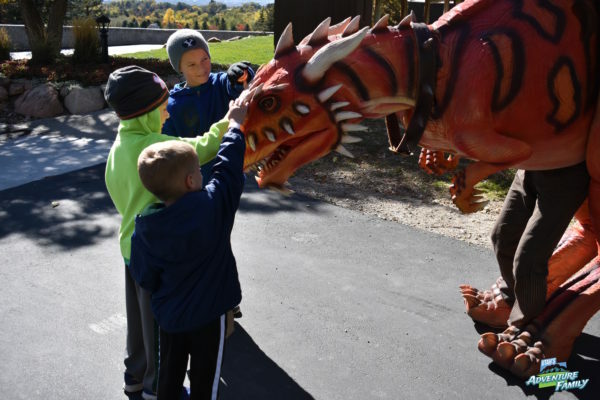 There are big slides, a small corn maze, a pumpkin patch, farm animals, and lots more. Check their Facebook page for all the info. This place was tons of fun! 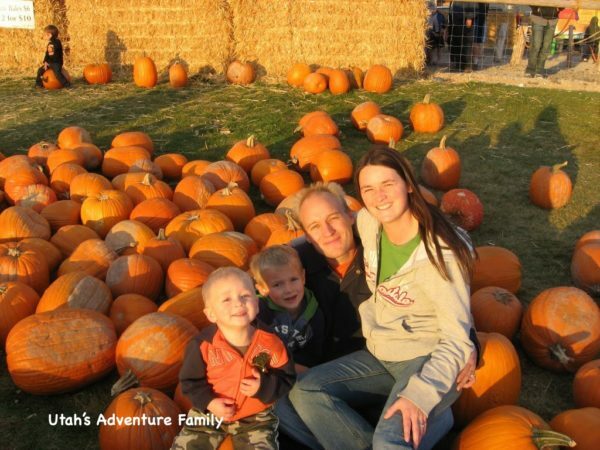 This locally owned pumpkin patch is a lot of fun, and it has a great cheap price. Only $3/person to get in and there is a wagon ride, corn pit, big slides, corn mazes, and farm animals. They have pumpkins for sale at great prices, too. We stop at Jaker’s every year! Jaker’s is open September 29-Oct. 31, 2018. Hee Haw Farms is a fun farm and pumpkin patch. This is a fun pumpkin patch that we seem to end up going to every year on field trips! We love how many fun activities for younger children them seem to have: slides, bean bag toss, corn pit, and more. 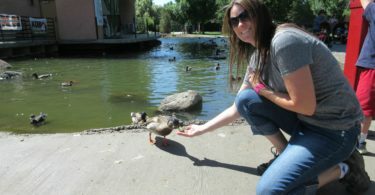 They also have an awesome petting zoo where you can walk in and pet lots of animals. This activity opens September 29-November 4, 2018. There were many different kinds of pumpkins. This pumpkin patch is changing a little bit this year. In 2018, they will be charging $5 admission, but it is good for a month long pass including the Harvest Festival. 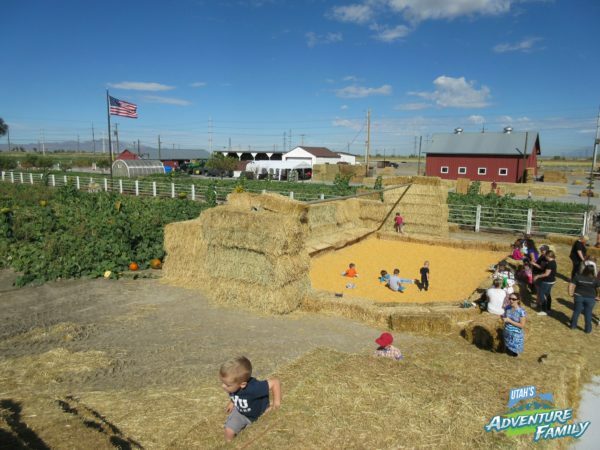 You can see the animals, climb the straw pyramid, and check out the mini corn maze for free. There are a few other activities that cost a small fee. We like looking at all the unique pumpkins they grow here on this local family farm. The pumpkin patch is open September 29-October 31st, and the special Harvest Festival on October 13. 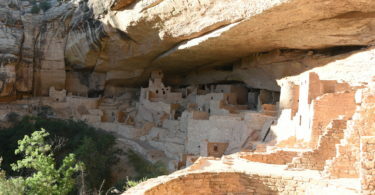 We will have to visit again and see how it is has changed. We visited Rowley’s Bid Red Barn Fall Festival a few years ago, but they have changed a few things since we last went. The price is a little higher, but they have added a huge corn maze and apple cannons which sound super fun. They still have the big sand box, pedal tractors, and the huge slide, and lots of treats back at the big red barn. 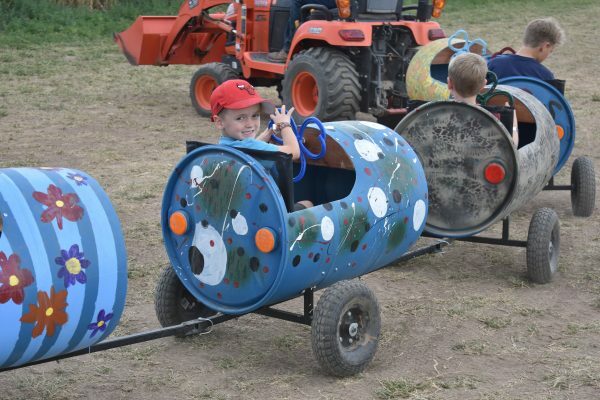 Their wagon rides to the activities begin September 22-October 30, 2018. This farm has their Fall Fair set up like a carnival with a few rides, corn maze, wagon ride, slides, and great photo spots. We had a really fun time at Wilkerson Farm. The Fall Fair runs September 15-October 31. Cost is $9/ages 5 and up, and they are open 10-8 every day except Sunday. Brand new in 2018, Glen Ray’s Corn Maze and Pumpkin Patch is a fun spot for families. There is a corn maze with corn fairies to search for which entertains the kids for hours. There are big slides, tractor rides, animals to see, and a separate area for smaller kids. We had a great time playing here! This is a great Halloween adventure! This pumpkin arch is amazing to see. You are allowed to get out and walk under the arch, so that you can hear the music. We were able to talk to the owner and he hand carved every single jack-o-lantern. Our boys loved it! This show usually runs about 1-2 weeks before Halloween. We loved the singing monsters! Monster Radio is a simple light show. The four monsters pictured above sing all the songs. The lights move so it looks like they are singing! We laughed at how fun and silly it was, and we enjoyed all the great Halloween music. This show usually begins the middle of October. 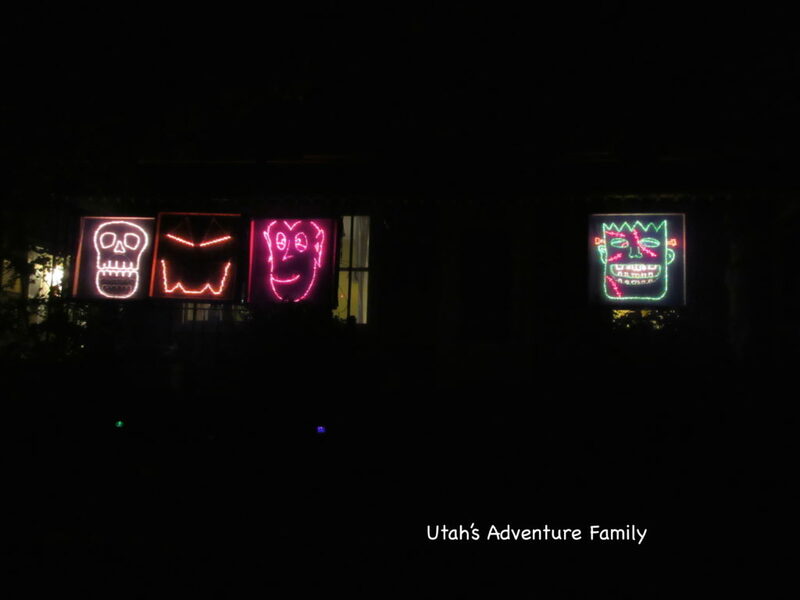 There are a few homes in Lehi within a mile of each other who have some great Halloween light displays. We love our local lights, and it’s fun to see the different displays all in one night. 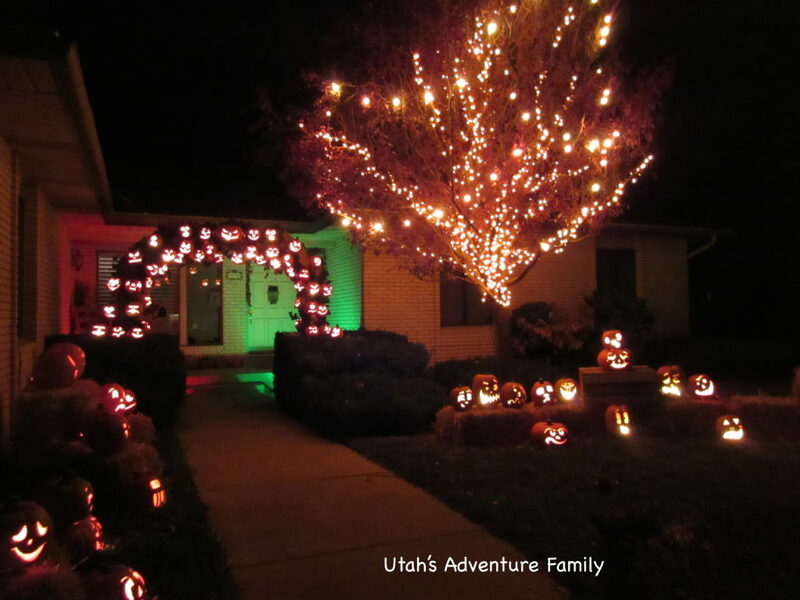 So load up the car and have a fun Halloween light adventure right here in Lehi. 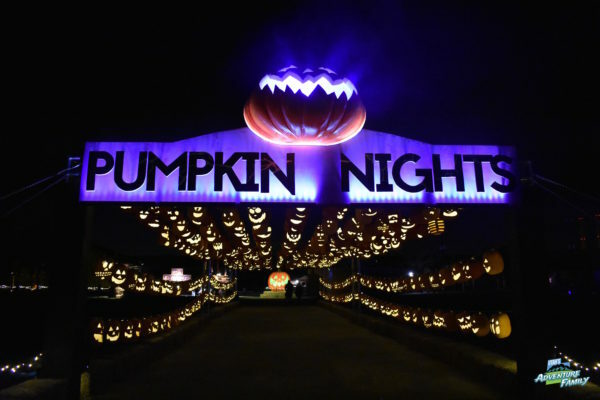 There is a new event happening at the Utah State Fair Grounds called Pumpkin Nights. 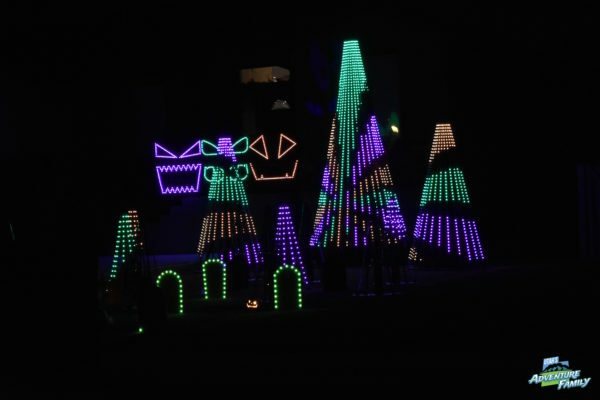 There is a 1/2 mile walk through the grounds where you will see tons of carved pumpkins lighting the way, and carved in unique ways. There is even a dragon made entirely of pumpkins. It’s so cool! This is a pricey event, but definitely a unique activity. This show will run October 5-November 4, 2018. 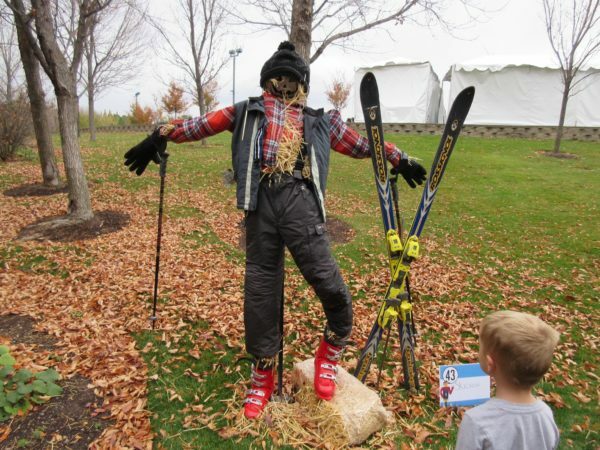 Thanksgiving Point hosts a Scarecrow Festival in the Ashton Gardens. Families and businesses create scarecrows that are displayed all over, and you are allowed to vote on them. Our boys loved picking a favorite, and they loved seeing the variety of scarecrows. If you are a Thanksgiving Point member, this is free, but others will need to pay the admission to the gardens to see the scarecrows. You can enjoy the entire gardens with this admission. This festival runs from October 15-October 20, 2018. 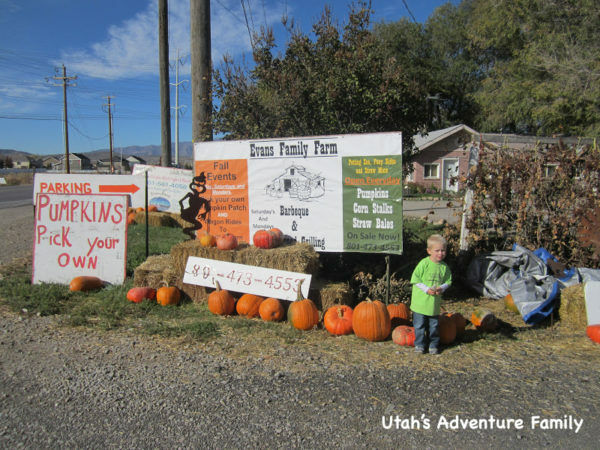 We love riding on the “Heber Creeper,” and the Pumpkin Train was a ton of fun. The train ride takes you on a short ride, but there is karaoke and dancing along the way. You also get a cookie and a pumpkin for riding the pumpkin train. We loved walking through the spooky train car that was very family friendly. Watch for deals on KSL for $5 tickets! 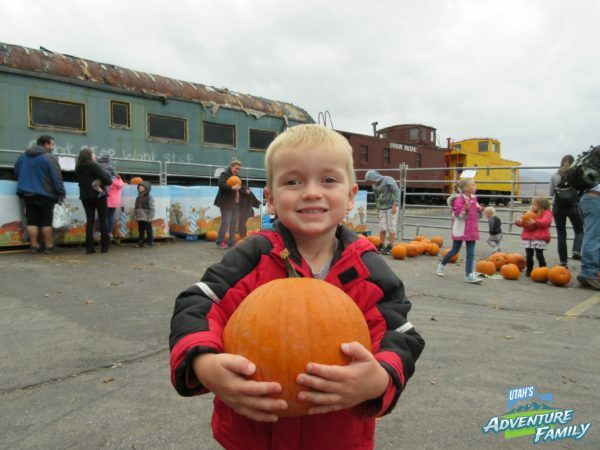 The Pumpkin train runs Oct. 4-29, 0218. We love visiting The Leonardo any time of the year because of all of the hands-on, fun exhibits that they have for children. 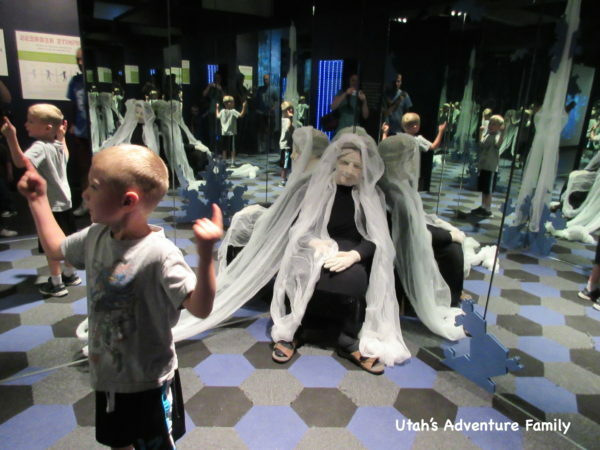 Spooky Science is an extra fun exhibit because it takes science and adds some Halloween fun. We enjoyed wandering throughout the museum and finding Spooky Science activities. And you can enjoy the entire museum with your entrance fee. Scary Hill isn’t very scary, in fact it’s a really great family friendly place to spend a Fall afternoon at Cherry Hill. The miniature golf course is decorated for Halloween, and so is the maze. 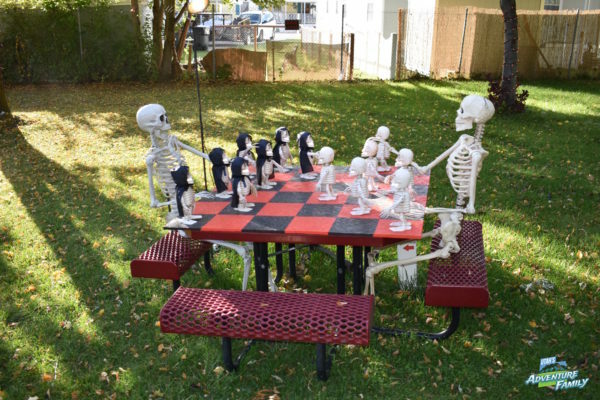 The best part is the wagon ride through “The Boneyard.” There are skeletons playing chess, dressed as Ninja Turtles, fighting Darth Vader, and much more. It is a fun Halloween adventure. Little Haunts is a fun event at This is the Place Heritage Park. They hand you a bag so that you can trick or treat through the grounds. There are also stories and crafts through the village, too. Our favorite event was the candy cannon. You don’t want to miss taffy flying through the sky! Little Haunts runs October 13, 18-20, and 27, 2018. 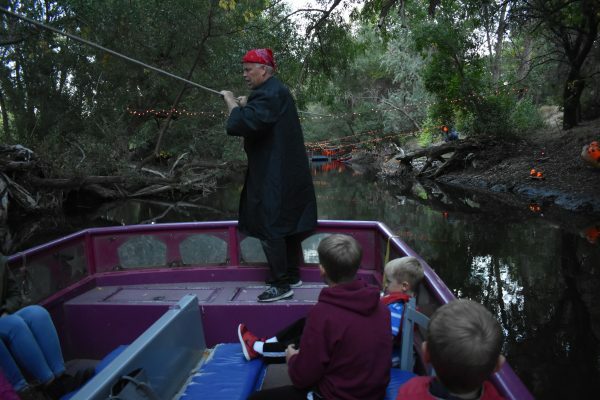 Clas Ropes hosts a unique Halloween Cruise in October where they pull you up and down the Provo River. There are hundreds of jack-o-lanterns and lights reflecting on the water, a pirate attack, and spooky stories. It’s very family friendly and fun to be on the water. 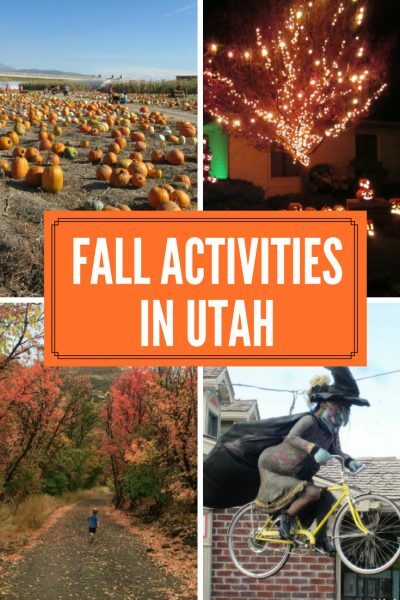 Here are some activities that we have on our Fall Bucket List to try. Hopefully we can make it to some of them this year. Please let us know if you have a favorite that we should add to this list. 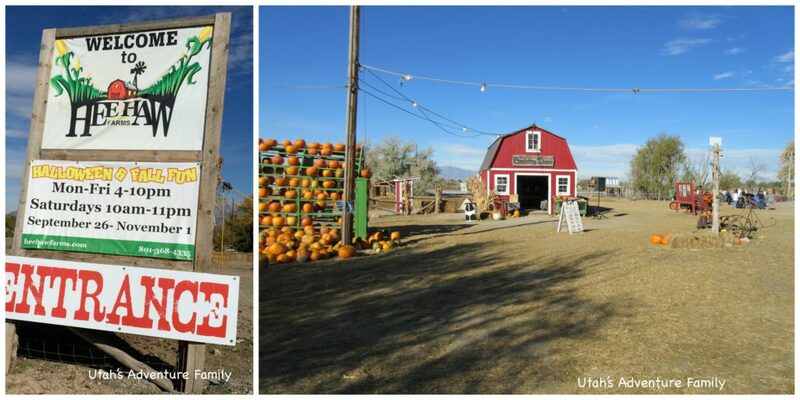 Pumpkin Days: Wheeler Farm, SLC, September 28-October 31. Fright Train: South Weber, October 27 at 1:00 pm. FREE. We have ridden the South Weber trains before, but not their Halloween train! Haunted Halloween Lair: Spanish Fork, October 25, 26, 27, 29, 30 and 31 from 7:00-9:30. FREE! They also added a light projection show that runs all month beginning on October 1. Olympus Hills Trunk or Treat:Salt Lake City, October 27 from 12-3 pm. FREE! 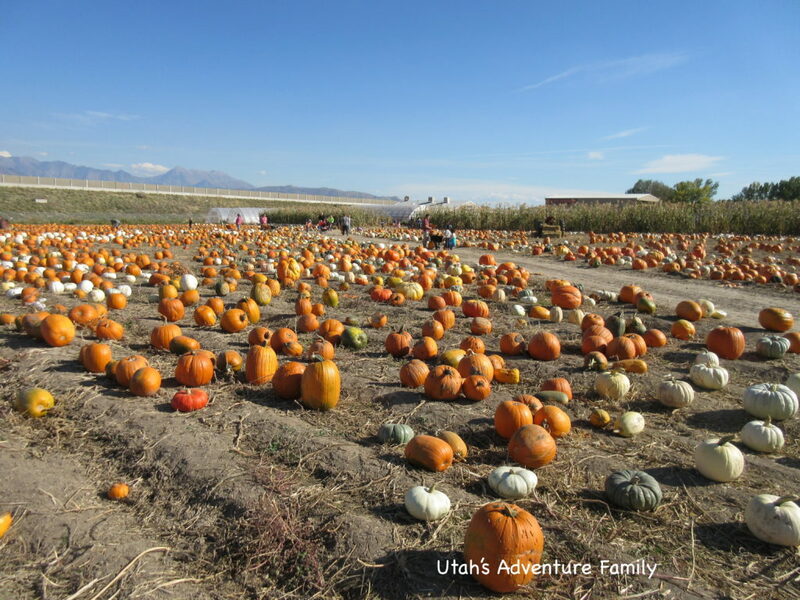 Pumpkin Walk: Central Utah Gardens in Provo on October 27 from 12-6 pm. FREE! Wear a costume for a free donut. Halloween Ghost Trails: Maple Dell Boy Scout Camp in Payson Canyon. October 27 from 7-10 pm.